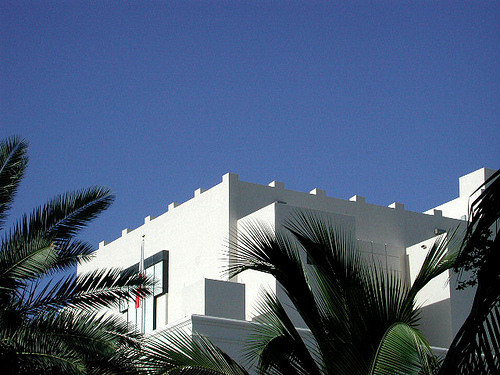 As will eventually become clear, I have a thing for white buildings against a particular indigo blue color of sky. This is particularly beautiful, more like a painting than a photograph. Every frond of each palm branch stands out sharply. The sun striking the side of the building illuminates it; the rest is in bluish shadow. The sky is that soft, even tint that gradually intensifies to an eerie crystalline color before fading to violet. I do not own the rights to this photograph, but am using it with the permission of the owner. Please do not save or use it without first getting her permission.